To find out the quickest way to energize the smartphone and tablet, PCWorld America has conducted a test to see how long it take to fully charge a device. 4 tested devices include iPhone 5 and Samsung Galaxy S III, iPad 4 and Samsung Galaxy Note 10.1. The experiment used the original charger of each phone, tablet and USB port (Mac's and laptop's using Windows 7) besides using the original charger of one phone for another phone and the original charger of one tablet for other tablet. 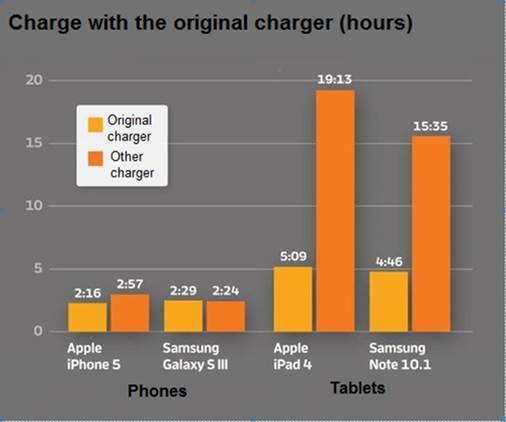 In general, fastest recharging time is the one using the original charger (charger comes along with phones, tablets). For 3 of the 4 tested devices, the original charger is fastest with its "companion" device. The only exception is the Samsung Galaxy S III, recharge time with the original charger is a little longer. The original charger is the one comes along with phones, tablets. The other charger is a proper charging device of other manufactures. The above results will surprise you that some devices take too long to be recharged without its original charger. In our opinion, all phones or tablet contains a circuitry to detect that whether the device's power is plugged in. If that charger is not for its own kind, it will reduce the current to avoid overheating the device. Perhaps this caution is the reason why the battery fully charged time takes so long. In short, if you travel or work without carrying the original charger, you will have to wait very long time for your device to be fully loaded. This test also tried to use the charger designed for the phone on the tablet, and vice versa. The results show that the phone does not have any problems when using the tablet's charger, but the tablet does not respond well to the phone charger. Results of charging tested device by other device's charger. Here, Samsung Note 10.1 is worst when it takes 15 hours 29 minutes to fully charge using the charger of the Samsung Galaxy S III. However, the iPad is not any better when it takes more than 10 hours to fully charge with the charger of the Iphone 5. The reason is that while the iPad charger supplies 2100 mA current, the iPhone charger only supplies 1,000 mA current. This makes the charging for Ipad's large battery with iPhone's charger like using family pumps to pump water for a whole apartment. Although it still works, but it requires a lot of time. When it comes to charge your phone or tablet from the USB port, you should remember that not all USB ports are equally well done. The above test had charged 4 devices via USB ports of Lenovo ThinkPad Twist S230u notebook (running Windows) and MacBook Air. Results showed that the charging for mobile devices is quite slow. During the test, to charge via laptop, Samsung Galaxy S III took over 5 hours while the iPhone 5 takes 2-3 hours. That's because the iPhone 5 has a battery with 1400 mAh capacity, which is smaller than the Galaxy S III's 2,100 mAh. Both devices have used 500 mA while charging. 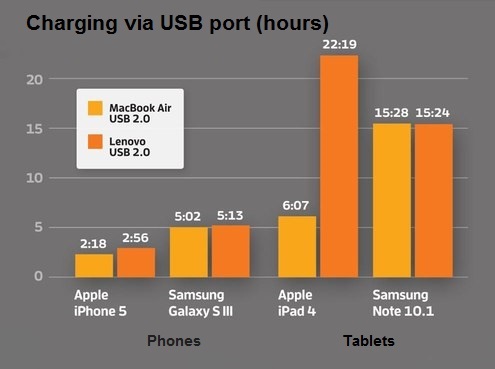 Meanwhile, the iPad only takes 6 hours to charge from the USB port of the MacBook Air, but it takes more than 25 hours to fully charge when connected to the USB port of Lenovo ThinkPad. The USB port provides various power levels, depending on the connected devices. The reason is the Apple's phone an tablet can load more power (1,100 mA maximum) from the USB port of the Apple device. 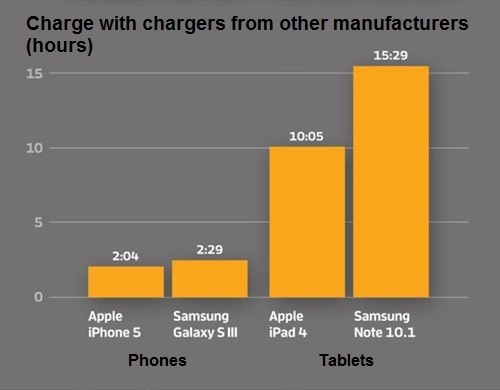 However, only the Apple products can do so because Samsung Note 10.1 takes over 15 hours to charge from the same USB port. 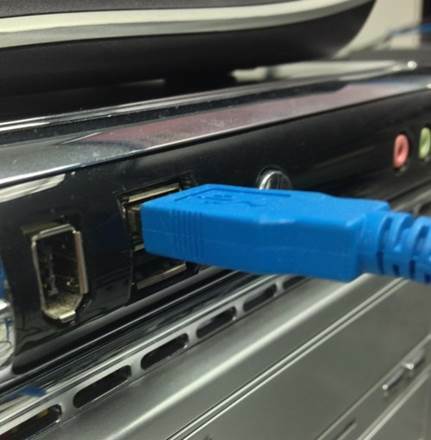 USB 2.0 port on a laptop can provide 500 mAh (with USB 3.0, it increased to 900 mAh), but only when the connected device request. If the device is not required, the laptop only provides about 100 mAh to avoid overload. Quick charge feature (faster-charging) is available on some recent modest computers, often referred to as the USB ports provide high currents. If you just bought a laptop, please read the user manual to determine whether it can offer this feature and how to use it. Experiment shows that you will charge your device fastest if you use the charger that come along with your device. However, if you only want to carry one charger on a trip for both iPhone and iPad, take your iPad charger instead of the iPhone charger. But do not use it too much because the manufacturer recommends that not to use the tablet's charger for mobile phones because the charging power source for tablet is larger than the one for phone, so the phone's battery’s quality can easily be reduced. For other devices, use the charger that manufacturers have dedicated test for each respectively device. Most manufacturers have a charger compatibility list for their products. A number of upcoming new technology is likely to speed up the charging time. For example, Qualcomm recently announced the new 2.0 Quick Charge standard that will allow energy's charger to reach 4 Amps (4000 mA). However, to use it you will have to have special chargers and devices will also have to support this standard.